The Manual Wheelchair is a device that dates back many hundreds of years, but truly began evolving during the early 1900's. Since then, tremendous headway has been made in the area of manual wheelchairs, as well as many advancements in the power chair market. Mobility Vehicles, like the wheelchair, help make life better for people of all ages and can also improve the life of caregivers. Please take some time to review some of the useful wheelchair resources below, or you can browse our recent articles. 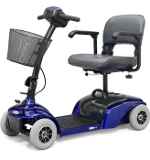 In addition to the above useful resources, we also cover a number of other topics related to wheelchairs and scooters, including reviews of different types of wheelchair lifts, including those for vehicles, and other senior health related concerns. The mobility scooter is a popular type of medical equipment, which offers a similar sort of functionality to an electric wheelchair. These devices have been around since the sixties, although they didn’t really become well known until the nineties. During this time, several popular manufacturers, like Hoveround, Golden Technologies, and Pride Mobility, all began manufacturing electric scooters in earnest and their popularity grew. The main difference between an electric mobility scooter and an electric wheelchair is their intended use. An electric scooter is designed as a secondary mobility vehicle, primarily with the intention of making it easier for seniors, and others, to move across longer distances. This makes them popular for use at the shopping mall or grocery store, as well as parks and other public places where one might do a good deal of walking. Electric wheelchairs on the other hand, or for that matter wheelchairs in general, are typically designed as a primary mobility vehicle, so are often used for all types of accessibility. As a result of the difference in the way this type of medical equipment is intended to be used, the design is a little different from that of a wheelchair. Electric scooters are designed to make it easy to get off and on the device throughout the day, with a larger base and swiveling chair. Most also have a control system that extends out from the front of the chair, on a pivoting arm. This way, the controls, which at minimum usually include acceleration, braking, and steering, can be moved closer to the user when driving, while swinging up and out of the way when entering or exiting the vehicle. Since many people use their scooters away from home, being able to travel with them is often important. Most scooters, even the very large heavy duty types, which can support over 400 pounds, are designed to be taken apart in a few sections. This makes them easier to manage and allows them to be stored in the trunk of a car. However, depending on the size of the scooter, this can still leave the user with a very heavy base, which is far too heavy for the average senior to lift, so many people use vehicle scooter lifts. These lifts make it easier to transport a scooter within a car or SUV and there are a few different designs. One of the most common is the hitch mounted scooter carrier, which installs quickly and easily onto the hitch of a truck, van, suv, or larger car. Then, the scooter can either be lifted with an electric platform or driven onto a ramp, to place it on the scooter carrier. These are popular because they can be installed in minutes and don’t generally require any sort of vehicle modification. However, the downside to these types of scooter carriers is that the scooter is stored outside of the vehicle, so it is exposed to the weather and road-hazards. For larger vehicles, like some SUVs and vans, internal scooter lifts are available, which typically work by lifting the scooter from the side or rear of the car, into the vehicle cabin. These offer more protection and convenience, although because of the amount of space they take up inside the vehicle, as well as the necessary vehicle modifications to install them, they do have a few drawbacks. Another option is to use a crane lift, which is popular for those who transport their scooter in the trunk of a passenger car, although they can be used with any type of vehicle. The crane lift essentially operates similar to a crane you would use in construction, with a pivoting arm and extending cable that gets attached to the scooter, in turn lifting it. For those who want to use this type of scooter lift in the car, the scooter will usually need to be dissembled first, and there will be some bending still as the lifting rope gets attached to the scooter. Travel scooters are also available, which offer a more lightweight design and are made so that when they have been taken apart, none of the pieces are overly heavy. This can make moving them a bit easier, but they are not typically as sturdy as other types of scooters, nor can they travel as far on a single charge, as they are designed with weight in mind. Wheelchairs provide a powerful tool for those who have difficulty walking, such as seniors with arthritis, or those who are otherwise mobility challenged. 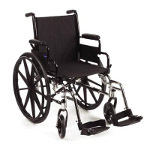 While there are a great number of different types of wheelchairs, the two basic categories are electric or manual. There are a number of factors, with cost often being one of the more pressing ones, which go into determining which type of wheelchair to use. Manual wheelchairs are usually the least expensive type of wheelchair, although there are a number of different models and some of the more specialized ones are quite pricey. 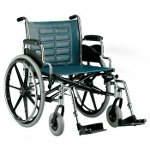 The manual wheelchair design dates back to a wheelchair first developed during the first part of the twentieth century. They feature a hollow steel tube frame, which provides strength, while still being lightweight, as well as large side wheels. Typically, the wheels are designed so that they can be used to propel the wheelchair and include handrails that extend around the rim of the wheel. However, this is not always the case, as some manual wheelchairs, most often referred to as transport chairs, are designed to be pushed from behind. These chairs are often used by caregivers for seniors who have arthritis, as they are unable to propel the wheelchair on their own. In addition to offering a lightweight frame, the steel tube design usually also allow the wheelchair to be folded up. The type of seat present will often determine if the wheelchair is intended to be a folding manual wheelchair or a rigid one, as those with a thin vinyl seat can almost always be folded, while those with a more rigid cushion seat are sometimes designed to be non-folding. However, a non-folding manual wheelchair is the exception and not the rule. In addition to the standard wheelchairs most people have come to expect to see at places like the hospital or amusement parks, a number of more advanced sports wheelchairs are also available, which are used to do things like play wheelchair basketball or racing. Electric wheelchairs are usually much more expensive than a standard self-propelled wheelchair and come in a number of designs and styles. The needs of the patient often plays a factor in what type of wheelchair is needed, which can affect the cost. 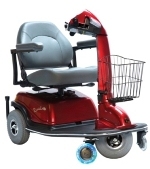 While there are a number of different styles available, most share a similar design, with a plastic base, which houses the electric motor and wheel-base, with a chair on top. Unlike manual wheelchairs, in most cases the chair closely resembles an office chair, although typically with more cushion and a higher back. The wheel-base is either four wheels or six-wheels, which is the design used in a mid-wheel drive wheelchair system. The advantage of a mid-wheel design is that it provides much more maneuverability, at the sacrifice of a little stability. The drive wheels are the middle set, while the sets at the front and back merely provide support for the user. The wheelchair itself is controlled by a hand control, which is usually found in the arm-rest of the chair. Most utilize a joystick control, which is based off on of the earliest electric wheelchair designs that dates back over 50 years. However, for those who are unable to use their hands, a number of alternative control devices are available, like breath operated wheelchairs, in addition to available controls for care workers. In the home, while building codes and inspections are required, there is generally a much more relaxed attitude towards the use of safety devices, such as wheelchair ramps or porch lifts, but in a commercial environment, there is a much stricter process of ensuring that these sorts of devices not only meet code, but also receive regular maintenance. For this reason, when someone wants to install a commercial wheelchair lift, there are a number of factors that must be considered. Porch lifts, which is a more colloquial term for vertical platform lifts, are in many ways very similar to an elevator. However, where an elevator requires a great deal of structure, namely the elevator shaft, a vertical platform lift is a single self contained unit. The main advantage of vertical platform lifts over elevators is that they can be placed next to a staircase, providing full access to the area, but with little actual modification to the existing structure of the building. When considering installing a commercial wheelchair lift, however, the distinction between elevator and wheelchair lift is often a little less clear, as many cities and municipalities classify these devices as elevators, which must meet similar codes and requirements. So, the first step for any business owner wishing to install a vertical platform lift, should always be to check city or county codes. A good place to start is to call up your local inspector, which is often located in town hall. If they do not know the codes that a wheelchair lift would fall under, they will be able to point you in the right direction. However, it is important to find and read the required code, with reference books often being available at the library. Making sure the wheelchair lift meets code is important not only for safety and inspection purposes, but also for reducing the risk of a lawsuit or injury. It is important to keep in mind that while in some cases, a vertical platform lift might bring a busi9ness up to code, such as if the business does not meet ADA standards and has no wheelchair ramp, it can also open the business owner up to litigation if there is an injury on the device or a malfunction. There are several things that a business owner can do to mitigate these risks, such as using a commercially rated wheelchair lift that well exceeds the lifting requirements of the users. In addition to a larger lifting capacity, having a locking mechanism, so the wheelchair lift can only be operated by authorized personal is also very important. It is also essential that a door is present at the top of the landing, so when the wheelchair lift is moving or at the bottom of the stairs, someone can not fall through the opening. Many commercial wheelchair lifts include a built in door, but it can also be added as an extension of the existing handrail. In homes that have a staircase on the front access, it can be very difficult for wheelchair users to safely and conveniently get into and out of their home. There are a number of options available to help make this task easier, but in most cases, the wheelchair lift is the most effective and safest type of home mobility aid. Traditionally, wheelchair ramps have been used to allow full access to a home. These are commonly seen on commercial buildings and often on homes as well. For non-commercial use, the most common type of wheelchair ramp is the wooden one, which is made in a manner similar to building a deck. There are a number of wheelchair ramp plans available and most capable contractors or handymen can build one, with most areas having companies that also specialize in custom wheelchair ramps. Generally, if you would not feel comfortable building your own deck, it is not a good idea to build a wooden wheelchair ramp. In addition to wooden ramps, there are a number of pre-made metal ramps. Some of these are simple metal planks or threshold ramps, which are mainly used when there is only a step or two that must be navigated. For larger staircases, modular metal ramps are available, which come in sections and can be fitted together very easily. While wheelchair ramps, at least wooden wheelchair ramps, are usually a good deal less expensive than a wheelchair lift, they can take up a lot of space. In the case of wooden ramps or modular ramps, it is not common for a significant amount of the front yard to be taken up by the wheelchair ramp. Smaller ramps, which are used when there is just a step or two, can make regular use of the staircase more difficult. Wheelchair lifts are usually a more expensive option than building your own wooden wheelchair ramp, although modular -metal wheelchair ramps can get much more expensive and are often similar cost to a wheelchair lift. However, the added cost comes with a great deal more convenience and flexibility. Wheelchair lifts, or vertical platform lifts, are basically a completely self-contained elevator unit, which is placed next to a staircase. Since the vertical platform lift is self-contained, there is no need to modify the home, such as you would need to do when building a residential elevator. Instead, the wheelchair lift can be placed directly next to the staircase and used to lift the user safely and quickly to the landing. The biggest concern with an outdoor wheelchair lift is that the base that the unit sits on is well made and provides adequate drainage. A concrete base works best, although a wooden base can also be used, providing it is sturdy enough to support the weight of the vertical platform lift and its occupants. It is also very important to consider things like overhanging branches, which could fall on the lift during a storm and damage it, as well as roof water run-off. In the case of the latter, it is very important that gutters are installed above the wheelchair lift and that ground water can not build up around the base of the device. In addition to being easier to use, wheelchair lifts are installed on the side of a staircase, next to the landing. This means that full access to the steps will be maintained, with no obstructions. On interior staircases, a wheelchair lift is not always an option, as the lift must be installed next to the staircase’s landing. This is one of the reasons vertical platform lifts are often called “porch lifts,” as they are most often used on the front porch of a home. For interior staircases, an inclined platform lift can sometimes be used, which provides a platform that moves along the length of the staircase, instead of vertically. These take up a lot of space though, so are more common on commercial stairways. What Type of Wheelchair is Best for Me? A wheelchair is probably one of the most recognized types of home medical equipment and dates back much further than other types of medical equipment. However, even though the history of the wheelchair, can be traced back many thousands of years, the modern wheelchair has roots that are much much younger. Today, most manual wheelchairs feature a folding frame that is made out of lightweight hollow metal tubes. The seat has traditionally been made out of vinyl that is sewn around the wheelchair frame, although many newer wheelchairs incorporate improved padding and support. To allow the wheelchair user to self-propel, a manual wheelchair has large real wheels with metal hand-rims attached to the outside of the wheel. The handrims allow the user to spin the wheels freely and easily, without making contact with the part of the tire that actually touches the ground. 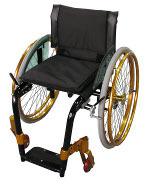 The front wheels are much smaller and are on pivots that allow the wheelchair to be turned simply by pushing it in a certain direction or by applying more pressure to one of the handrims. These modern manual wheelchairs vary slightly in features, with some offering things like adjustable axles or different types of front rigging, which is the place at the front of the wheelchair where the user places their foot. However, the basic design is based on the Everest and Jenning’s Wheelchair(E&J Wheelchair) that was developed during the 1930′s. At this time, most wheelchairs where made out of a combination of wood and wicker, making them extraordinarily difficult to transport and also very hard to self-propel. Two inventors, named Everest and Jenning, set out to build a wheelchair that could be easily moved from place to place and also used without the help of a caretaker, creating a wheelchair frame whose influence can still be seen today in virtually all types of manual wheelchairs. The manual wheelchair remains the most common type of wheelchair, with many people now opting to use a sports wheelchair, which is typically smaller and offers a number of performance improvements, but electric wheelchairs are also quite popular. Electric wheelchairs are much more expensive than manual wheelchairs, but since the device is powered by an electric motor, it requires little effort on the part of the user, aside from pushing the hand control in the desired direction. Electric wheelchairs come in a number of different shapes and sizes, as well as offering a number of different control methods, but the joystick control remains the most common. The joystick is mounted to one of the armrests of the wheelchair, allowing for either left hand or right hand use, with the wheelchair users simply pushing the joystick in the direction they wish to travel. For people with limited upper-body strength, a manual wheelchair is often too difficult to use, requiring a great deal of effort, which is the reason many people opt for an electric wheelchair, or power chair. For those who are unable to use the joystick control, a number of alternate wheelchair controls are also available. One of the earliest alternate controls, which was first developed around the same time as the first electric wheelchair during the 1950′s, relies on head movements to steer the wheelchair. There are also remote controls available for caretakers, as well as a variety of much more advanced systems, including those that allow the power chair to be controlled by the breath of the user. Wheelchairs continue to be one of the most common and well known types of home medical equipment, offering a way of improving accessibility. While power chairs are very convenient and easy to use, they tend to cost a lot more than manual wheelchairs, which can typically be found both new and used for at least a thousand dollars less than a power chair. Elderly people who have difficulty getting around often find that using a wheelchair is not the optimal solution, especially since manual wheelchairs can require a lot of physical strength to use. Instead, a mobility scooter is often a better choice and is usually considerably less than an electric wheelchair. There are also several types of scooters that are designed to fit special needs. For example, heavy duty scooters are designed to support more weight and preform better outdoors. Travel scooters, on the other hand, are essentially on the opposite side of the spectrum. Travel scooters are designed to be as lightweight as possible, so they can be transported easily without a scooter lift. They have fewer features and extras to help reduce weight, typically being designed to be broken down into several easy to manage pieces. Mobility scooters, which are also called electric scooters or adult scooters, have been around for about fifty years, but did not really start to gain popularity until the 1980′s. Since then, names like the Rascal have become household names and many people take advantage of this powerful type of home medical equipment. Travel Scooters are often the least expensive type of mobility scooter and are designed to be taken apart into several managable pieces. Many include special clips that allow the scooter to be broken down quickly, often with only one hand. When dissasembled, the indivudal pieces of the travel scooter are lightweight and easy to move, with the heaviest piece often weighing less than 30 pounds. Heavy Duty Mobility Scooters, as the name implies, are the Mack Truck of mobility scooters. They are much larger than other types of mobility scooters, making them more difficult to transport, but have a much higher weight rating and are designed to preform well across all types of terrain, including off-road. A wheelchair might seem like a rather straightforward device, but there are many parts that go into a modern wheelchair, with some helping to improve the wheelchairs performance, as well as making it easier to use. Today, most manual wheelchairs use a design that is based, at least in part, on the E&J wheelchair, which was developed right before WWII. Not everyone is familiar with the E&J Wheelchair, which is the name of its inventors, Everest and Jennings, but most people have seen them. This is the design that uses hollow metal tubes in the frame and a vinyl seat, which allows the wheelchair to be folded when not in use. The innovation of this lightweight folding wheelchair made it much easier for those who used wheelchair to be get around when it was first developed, as most other wheelchairs were made of heavy wood and other bulky materials. This not only made it difficult to transport early wheelchairs, but it also made it hard for users to self-propel their wheelchair. The E&J Wheelchair solved these problems and its effect on the modern manual wheelchair can still be seen today. Of course, the sports wheelchair is becoming much more popular, which is a lightweight wheelchair, with performance in mind. There are many different types of wheelchair sports, with many sports having a special wheelchair design. For instance, the wheelchairs used in wheelchair basketball are surrounded by a protective cage and metal bumpers to prevent injuries. However, there are many much more generic sports wheelchairs around, which are not necessarily designed for a specific sport, but instead include a number of performance features. This includes things like adjustable axles, smaller seats, low profile foot rigging, and many other performance tweaks that make it very maneuverable and fast. 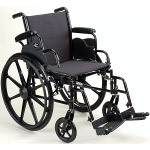 Many wheelchair users prefer the sports wheelchair design to that of a traditional folding wheelchair. As an example, most sports wheelchairs have a much lower back, which can make it much easier to turn and reach things behind you. While manual wheelchairs remain very popular, they require a good deal of energy to use, requiring that the person is fit and in good shape. This requires a lot of upper body strength and this is a factor that leads some to use Electric Wheelchairs, although a lot of people simply prefer a power chair to a manual wheelchair. 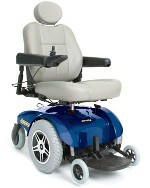 Power chairs utilize an electric motor and rechargeable battery, being very well suited for indoor use. Most preform well on packed ground as well, but some are more suited for outdoor use than others. Electric wheelchairs are more expensive than manual wheelchairs, but most travel over five miles on a single charge, which is no small task in a manual wheelchair. There are several types of electric wheelchairs, but two of the most common are the rear-wheel drive wheelchair and the mid-wheel drive wheelchair. A rear wheel drive electric wheelchair provides a slightly stabler base and is a little bit better suited for outdoor use than a mid-wheel drive wheelchair. However, because the drive wheel in a mid-wheel drive wheelchair is located at the center of the device, they are often much more maneuverable. Folding electric wheelchairs, as well as travel wheelchairs that can be taken apart are also available, which are not as high performance as regular power chairs, but are designed to be transported without a wheelchair lift. For many, the wheelchair remains one of the most well known and common types of mobility vehicles, providing a service that is different from that of something like a mobility scooter. Wheelchairs have a rich history of innovation and are as common today, as they were 100 years ago. Limited mobility and difficulty getting around are two common problems for the elderly. Often, conditions such as arthritis result in difficulty walking, especially over long distances, which can make keeping up with the grandchildren impossible. This is one of the reasons that many seniors use mobility scooters, which provide a motorized base that can make it possible to travel miles and miles, with only the push of a button. Mobility scooters are similar to electric wheelchairs, at least in regards to functionality, and electric scooters were first developed in the 1960′s, which is around the same time that the first electric wheelchair was developed. However, while the functionality of a power chair is similar to that of an electric mobility scooter, they feature a design that is much different. This difference in design is in part because where electric wheelchairs are designed for those who can not walk at all, mobility scooters are intended to be provide a supplement to walking. Most mobility scooters feature a long base, with a chair mounted towards the rear of the base, above the electric motor and batteries. A set of handlebars, called a tiller, is installed on the front of the electric scooter and is used to control the direction and speed of the scooter. As a result, however, it is not possible to drive a adult scooter directly up to a table or desk the same way you can with a wheelchair. Heavy Duty Scooters are on the other end of the scale, designed to support the most amount of weight and be driven over much rougher terrain. They usually are much larger, featuring a big captains chair, higher top speeds, larger tires, and many other features, such as improved bumpers and reinforced structures. A heavy duty scooter can be a great choice for those who like spending time outdoors, as they are the most versatile and can be driven over most types of ground. This versatility comes at a cost, however, as their large size means it is necessary to use a scooter lift to transport them and that they are not always as well suited for the tight corners of a home. Heavy duty scooters are also the most expensive type of scooter. Standard Mobility Scooters form a nice middle ground, offering improved weight and power capacities over a travel scooter, while being smaller and easier to manage than a heavy duty scooter. For everyday use, a standard scooter is usually a good choice, as it has a long range, is very reliable, and includes a lot of features that are taken out of a travel scooter to reduce weight. What Are Manual Wheelchairs and Why Are They So Popular? Choosing the best type of wheelchair is something that often comes down to personal preference, although there are certainly a number of other factors involved in this decision, such as physical capabilities and cost. For many, despite the allure of an electric wheelchair, even those heavy duty models that can be driven almost anywhere, a manual wheelchair is still the first choice. Manual wheelchairs have been used for thousands of years, but the modern design used today is based off of a 1930′s wheelchair called the E&J Wheelchair, developed by Everest and Jennings, two inventors. While there have been many improvements to the manual wheelchair since then, including improved metal working techniques and axle technology, the basic design is quite similar to these early models, which features a hollow metal frame to reduce weight, as well as allowing the wheelchair to be folded when not in use. A lot of physical effort is required to use a manual wheelchair, which is propelled by the user who pushes on the large rear wheels. A set of hand-rims extends from the wheel, which allows the wheels to be spun easily, without having to touch the part of the wheel that makes contact with the ground. Of course, while many people choose to self propel their manual wheelchair, most also have push handles on the back, so the wheelchair can be pushed from behind. The front rigging of the wheelchair is the part where the user rests their feet and typically provides two foot rests, although some provide only a single long foot rest, which can be folded up or removed quite easily. A set of parking brakes is also usually attached to the larger rear wheels, which work by simply applying pressure to the wheel and lock in place, holding the wheelchair still. One of the main improvements to the original E&J Wheelchair has been to the rear axle. The axle connects the two rear wheels, allowing them to spin in unison and makes it possible to move the wheelchair easily in a straight direction, as well as making turning easier. Not only has the axle itself been improved mechanically, but many wheelchairs now offer a movable axle, which allows the user to change the weight distribution of the wheelchair, as well as reducing or increasing resistance. Of course, cost often also plays a factor, as manual wheelchairs are much less expensive than electric wheelchairs. There are many types of manual wheelchairs and one type that has become quite popular in the last 10 or 20 years is the sports wheelchair. Sports wheelchairs come in a variety of designs and styles, including many specialized wheelchairs designed for specific wheelchair sports. For example, sport wheelchairs designed for wheelchair racing have a very long wheelbase, with the front wheels extending several feet from the rest of the wheelchair, helping to improve stability. Wheelchairs designed for wheelchair basketball, on the other hand, typically have a special metal guard around the chair to protect the user. Of course, sports wheelchairs do not always have such a glaringly different design and many are simply designed to be as light as possible, while including mechanical upgrades to improve performance. Often, they will feature a more comfortable seat that is made out of a very breathable material, as opposed to the vinyl often used in manual wheelchairs, as well as a lower back or even no back at all. Many find that sports wheelchairs are more practical, even though they don’t play a particular sport. For instance, for those that work indoors, the lower backrest found on most sports wheelchairs makes it much easier to turn and work around a desk without being inhibited. So, it is common for people to prefer a sports wheelchair over a standard design.